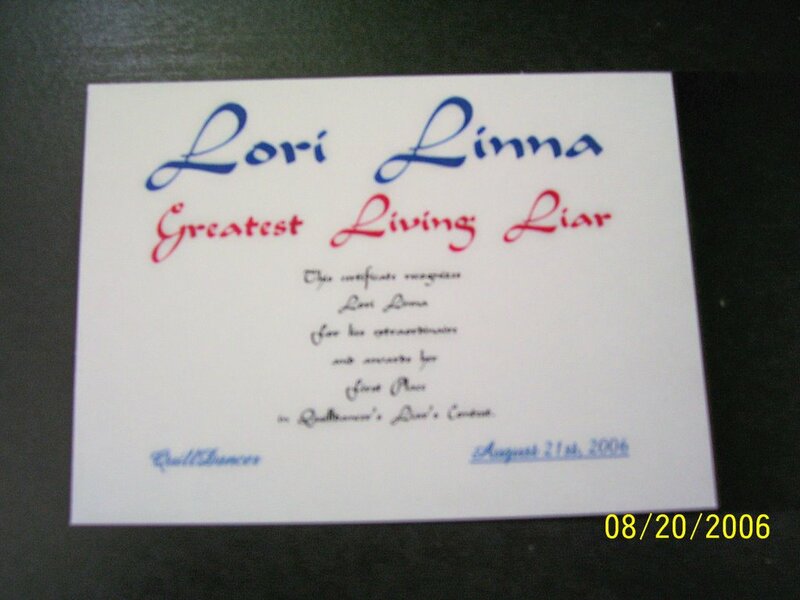 ............Lori Linna .....Greatest Living Liar ..This certificate recognizes ..........Lori Linna .....for lies extraodinaire .........and awards her ..........First Place in QuillDancer's Liar's Contest ........Dr. John Linna Almost the Greatest Living Liar ..This certificate recognizes ........Dr. John Linna ...as an excellent prevaricator .........and awards him ..........Second Place in QuillDancer's Liar's Contest ............Donna K. .........Liar in Training ..This certificate recognizes ............Donna K. .......for passable lying ... .....and awards her ...........Third Place in QuillDancer's Liar's Contest QuillDancer's Honorable Mentions: My favorite lie came from Sarah, because it was apparent she has been reading my blog for awhile and she tailored her lie to fit right into my real life experiences. 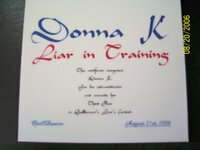 I also fancied these lies: Goldennib 1 -- for the surprise ending; although her second lie was also quite imaginative. 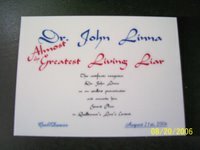 I must admit, when I saw how close Lori and Dr. John were, I almost cast one more vote to tie them so Nessa could win third place. Old Fart -- because I am an Ian Flemming fan -- and because this lie is as close as I'm ever going to get to being a "Bond Girl." 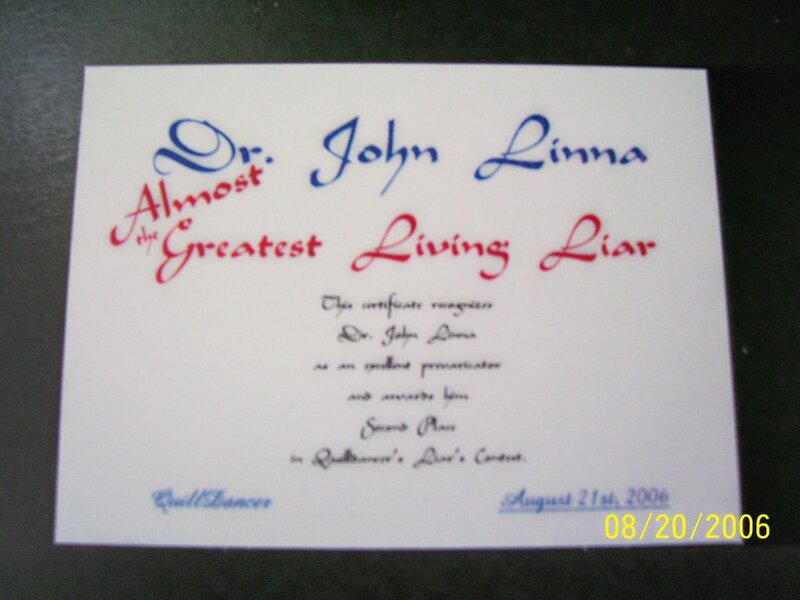 Tina's Lie -- because in the eight years I've known her, Tina's sense of the ridiculous has never stopped cracking me up. Ms. Liz -- because, although it wasn't our first meeting, her story contains a great amount of truth. Jenn 2 -- because she captured my personality to a T.
Just been over to Belle's to vote for your again. This makes 3 or 4 times now. Thanks for the "Honorable Mention". I think you'd make a good Bond Girl. Maybe on the same calibre as "Diana Rigg" in OHMSS. Remember before she became Mrs. 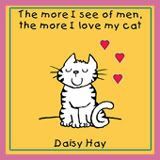 Bond, she was Mrs. Peel in "The Avengers"
That Miss Moneypenny was meant for you. Congratulations to all of the winners. It was fun reading everyone's stories. Congratulations to the winners of the liar's contest. I know your families must be proud! Thanks for the honorable mention. I've been reading your blog for quite a while now. I found it through another blog that I enjoy, concept of irony. Your clever comments there, made me want to read more of your writing. As I was voting for you on Belle's, my husband said, "Wait, I like quilldancer, I want to vote,too." Your fame is spreading like a wildfire. Keep up the good work. Thanks for playing. I had a great time. Thank you! Wow! I am becoming famous. [Down ego, down!] Thank you for playing. Remember to say, "Hi," from time to time when you stop by. Thank you, thank you all for your votes, I am honored to be with such a talented group of Liars. I know I had a lot of help from my in-laws and could not have won without them. I plan to have an acceptance speech soon on my blog. This was really neat. I had a great time and enjoyed getting to meet Betty and stopped by a few other blogs as well. Hope you are having a great first day back at school. Hugs!! I came up with a much better lie this morning. I would tell it to you but I have already forgotten it. That's the problem with lies. They are hard to remember. I just went and gave you a bunch more votes at the caption contest. Jor the Mason had edged by you. Everyone needs to go vote for Quilly. Her caption is the best. Hi there. I saw you over at Doug´s place and liked the quill avatar :) I am simple like that. So I decided to come and check you out. I love your template and I added the Icelandic flag to your Visitor map! Minka, welcome! Coem back often. I'll be by to visit you in just a bit. Jenn & Donna -- thank you. Keep voting. The contest ends tonight. I don't trust that sneaky Joe not to go in and rack himself up a truckload of votes. 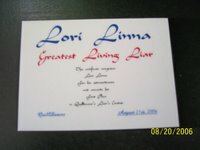 Ladies and Gentlemen, run over to Lori's blog and read her acceptance speech. It is a riot. If you can't find it in your jealous bone to congradulate her on her win, then congratulate her for having such an awesome mother-in-law!